On 26 and 28 February, follow-up meetings were held in Brussels for the European projects Ecoxy and Recysite. Cidetec is involved in both projects and is the Ecoxy project’s coordinator. The first Ecoxy follow-up meeting was held at the BBI JU’s offices on February 26 and Cidetec’s representatives were Ione Cendoya, Sarah Montes and Aratz Genua. At the meeting, a review was made of the progress of the first stage of the project (M1-M18) and the main results obtained. Each WP leader spoke about how their work package had advanced and its results, and Cidetec provided a general overview and a preview of the next steps to be taken, as described in the DoA and in accordance with all the observations and suggestions received by the PO and the external experts. In short, the project can be said to be making good progress and both the PO and the experts are satisfied with the results presented. 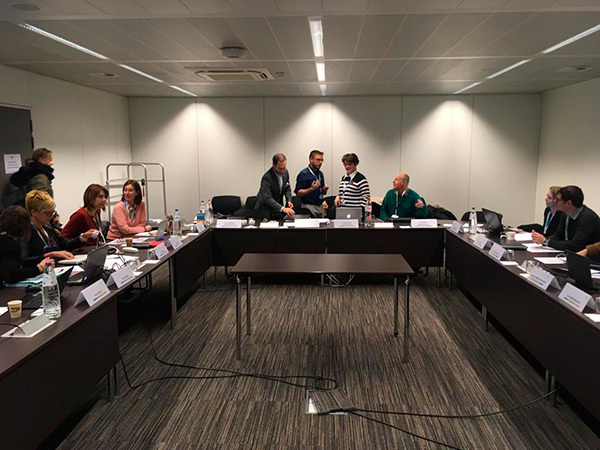 Also, the follow-up meeting for the Recysite project was held at the CNRS offices in Brussels on February 28, attended by Aratz Genua in representation of Cidetec. At this meeting, the progress made on the project over the last few months was reviewed and the work to be done until the project’s completion in June 2019 was defined. The consortium’s next meeting, which will be the last for this project, is due to be held on May 22 and 23 at SISPRA’s facilities in Zaragoza. It will be attended by the Project Officer and the EASME monitor in addition to all the project partners.